Posted on October 23, 2017 Categories DecoratingLeave a comment on Anyone Can Install Custom Made Wood Blinds! The timeless appearance of plantation shutters adds long-term value while inspiring upscale design that feels like home. However, these beautiful window treatments won’t do you any good if they’re unmaintained. Luckily, shutters don’t require an enormous amount of maintenance, and are surprisingly easy to clean. But how do you clean your shutters the right way? There are several ways to clean them with minimal effort. The great news is that window shutters, whether decorative or functional, are relatively straightforward to manage. Use a feather duster or a dry cloth to brush off dust. You can clean the slats with a cloth or feather duster if you clean your window shutters on a regular basis. Wipe down dust with a clean sock. A sock is an effective cleaning hack that helps clean your blinds fast! This is the perfect cleaning device for removing dust from hard-to-reach window treatments on tall windows. The brush attachment of your vacuum cleaner picks up anything your regular duster might have left behind. Rub fabric dryer sheets onto both sides of the slats. Dryer sheets will not prevent dust, but it will cut down on the amount of dust that clings to your blinds or shutters. Use a toothbrush to remove dust from hard to reach spaces. If your shutters are extra dirty, wipe them down with white vinegar to keep your shutters nice and clean. Use a duster to remove dust: Run the feather duster or a dry cloth in between each blind, hitting the tops and bottoms. Vacuum off lingering dust: Connect the attachment onto your vacuum cleaner, and run the attachment over the shutters to remove anything left over. White Vinegar: Remove dirt and grime with a bowl filled with white vinegar. The white vinegar should remove most stains, debris, and dirt off of plantation shutters. 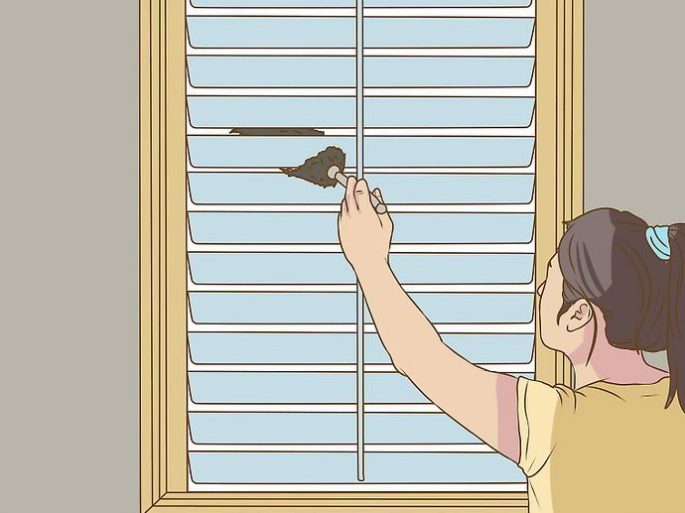 For easy cleaning, wipe down your shutters with a sock. Dip a clean, fresh sock in white vinegar, and wring the sock out. You want to make sure the sock is barely damp, but with just enough solution to clean. Place the sock over your hand: Run the sock over each blind. For extremely dirty shutters, have a few backup socks on hand. We recommend cleaning plantation shutters on a regular basis to keep dust, allergens, and germs at bay. Shutters are notoriously tedious to clean, and can be dust magnets. Are your plantation shutters located in a hard to access location? Your best bet would be investing in a blind duster with microfiber fabric. These dusters have a pole attachment that reaches high enough so you can go without having to get out a ladder. Liquid cleaners are not the best solution for plantation shutters, and we do not recommend cleaning your plantation shutters with water because most liquids can cause warping over time. But if you decide to use a liquid cleaner for your shutters, just use a small amount of white vinegar to clean off dust and grime. We hope this guide has answered a few questions, and points you in the right direction for which cleaning materials are best for your needs. If you have any questions, don’t hesitate to call one of our Blinds Online representatives. If you’re just starting to look for window treatments for your house or apartment, finding a place to start can be difficult. Between measuring your windows, figuring out the dimensions of the blinds you want, and installing them, can be overwhelming enough to make you want to just hire someone to do it all for you. But hiring a window treatment company to install your blinds is expensive when you consider the mark-up they will charge for their window treatments and labor. So, we have created this article as a starting point to help explain what the difference between blinds and shades are. Sometimes people use the terms blinds and shades interchangeably, however they are very distinctly different. It is very likely that while you’ve seen window blinds before, you have never stopped to think about what they actually are. Window blinds, quite simply, are window coverings made of horizontal or vertical slats. Typically window blinds are made of a few select, time-tested materials like aluminium (like aluminium mini blinds), wood (like real wood blinds), or a pvc-based material (like faux wood blinds). Window shades on the other hand are window coverings made of fabric. Because of the materials used, shades operate differently than window blinds and can feature a number of different aesthetic designs unlike typically much more neutral window blinds. Additionally, because shades are made of fabric, they can only be open or closed, unlike window blinds which allow you to adjust the level of light coming from the window. How do I want to control light flow and privacy? Privacy and light control are the main difference between blinds and shades for windows. Because shades are made with fabric, they cannot be adjusted like blinds can. However, by using light filtering shades, you can choose the level of opacity that your window treatments have, allowing you to have varying levels of light and privacy even when the shades are closed. How frequently are people going to be adjusting the window treatment? In areas with high volumes of traffic, like doors, it is often advantageous to opt for the most durable window treatments you can find. Because blinds are made from stronger, more rigid materials (like pvc or wood), they tend to last longer than shades which are made of fabric. For offices that share windows or doors, we tend to recommend using blinds as opposed to shades. One of the advantages that shades have over blinds is their ability to add insulation to your window. 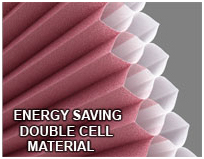 For improved energy efficiency in heating or cooling your home, cellular shades can be an excellent option. This is particularly helpful if you live in a place with extremely hot or extremely cold temperatures like the South West or the North East. Do I need to worry about child safety? Child safety and window treatments are an important thing to consider when you have children. It is estimated that every two weeks a child will be strangled by window treatments that are not set up properly or do not have the cord retrained. If you have children, or children visiting your home, choosing a cordless window treatment is an important choice to keep your family safe. How much money do I have budgeted for window treatments? If your funding to re-do your window treatments are unlimited, then there is no point in comparison shopping or installing yourself. But if you’re like most people, saving money on your window treatments is a priority. That’s why BlindsOnline.com keeps our prices at wholesale levels for everyone. Getting the right window treatments at the right price is possible without having to pay a premium to big box retailers. 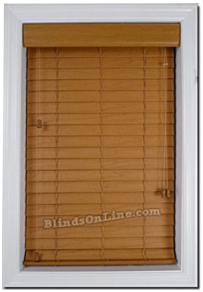 The difference between blinds and shades is subtle to people who are new to shopping for blinds online. This guide hopefully clarifies the question of blinds or shades and points you in the right direction for which window treatments are best for your needs. For answers to additional questions, contact us! Posted on June 28, 2017 June 28, 2017 Categories Cellular Shades, Window BlindsLeave a comment on What is the Difference Between Blinds and Shades? Posted on April 14, 2017 April 14, 2017 Categories DecoratingLeave a comment on What’s the Difference Between Inside and Outside Mounted Blinds? Minimalism in the simplest terms, is the concept of pairing down style elements to create cleaner, simpler looking, art. Using the term art broadly of course. Minimalism, made popular in the 1960s and 1970s, minimalism surfaced in painting, architecture, music, poetry, and even has contributed to a resurgence in interest in stoic philosophy. Minimalism is experiencing a resurgence in popularity in recent years. Below are some of our recommendations for window treatments to give your room a clean, open look, sure to appeal to minimalist lovers. Roman shades were originally developed in ancient Rome to help shield indoor areas from sunlight. White roman shades offer clean lines and simplicity of style that can compliment any room. One of the great things about roman shades is that they can be cleaned easily with a damp cloth or even a vacuum cleaner with an upholstery attachment. Historically speaking, this is the most ‘spartan’ you can get in terms of window treatments. White single cell shades offer the clean lines most minimalists are searching for with the added benefit of energy efficiency. Cellular shades are designed to trap a small pocket of air inside the cells which creates an insulating effect to help cut down on your energy bills. Part of the minimalist philosophy is to reduce the unnecessary from everyday life to focus on the essential. This closely aligns with the goal of single cell shades, which reduce your energy bill, so you can focus on saving money. White plantation shutters are one of the most popular window treatment that we carry at Blinds Online and for good reason. Composed using a pvc base for durability and resistance to humid climates. Easily cleaned with a damp cloth, plantation shutters give an incredible open feel to any room. Plantation shutters gained their popularity in the historic South before the civil war. However, they actually date back to ancient Greece, making them as historically significant as Roman Shades. Plantation shutters gained their name from their popularity as being used on massive plantation windows, providing privacy when needed, but plenty of sunlight when the slats are opened. Similar to our plantation shutters, our white vertical blinds are also made from a smooth PVC material for easy cleaning and resistance to humidity. Vertical blinds are the window treatment of choice for large glass sliding doors (like patio doors) and help provide privacy when you need it. One of the unique benefits of vertical blinds is because of their orientation, they are much less likely to collect dust than horizontal window treatments. First invented by Edward and Frederick Bopp in 1952, vertical blinds are a somewhat new creation when compared to previously mentioned styles. Minimalism is a wonderful aesthetic style that can really open up even the smallest spaces. In the end, it truly depends on personal preference, your window treatment goals, and what type of window you’re covering. No matter what style you’re thinking about Blinds Online can help you decide. Our customer service team can work with you to get your blinds to your home quickly! Give your home a coastal feel by installing composite plantation shutters. Plantation shutters add something to a room that no other window covering can. In addition to their sheer beauty and architectural detail, they are terrific performers at controlling light and privacy, plus when closed, they provide a bit of sound control. can be installed as “café” style which simply means that the shutter is only about one half as high as the window. This allows you to see outside and get light into the room while still providing some degree of privacy. Since plantation shutters provide complete light control they are a good choice for media rooms, bedrooms and offices where room darkening is desirable. When made of composite materials, these not only add a cool and crisp look to the window, they are easy to clean, water & humidity resistant and light in weight. Shutters can be ordered in 2 ½ inch or 3 ½ inch width giving you a styling option. Options for hidden tilt bar are also available. Whatever your preference, be assured that these shutters will last a long time and continue to look fresh and new. Installation can be done inside the window frame, if there is sufficient depth to accommodate the shutters or outside the frame. Outside mounting involves installing a frame of sorts on the wall or moldings that surround the window. Then the shutter panels are mounted to the frame. If you have tilt control windows or crank control windows there may be an interference with window operation so consider this before you order. The guys at BlindsOnline.com have done a good job of simplifying the measuring & installing process so almost anyone with a little skill and a few tools can do it. They have videos showing the entire process so give that a look before you decide if plantation shutters are for you. If you’re looking to save some money, buying your blinds online is one easy solution. Why? Well, when you purchase your window treatments online you are not paying for the convenience of having them installed by a professional – you have to do it yourself. Fortunately there are many window treatments that require very little effort to install. Renting a Condo – But Need More Shade From Your Neighbors? While there are certain benefits to living in a condo, like the price and luxury, there are also some downfalls – primarily that if you live on a lower floor or next to other tall buildings, you may be distracted by your neighbors (many homeowners may also face a similar problem). The good news is that you can improve your environment and your mood with one simple change: window treatments. Window treatments not only let you control the amount of heat and light that enters your condo, but can also create a barrier between you and your pesky neighbors. Continue reading Renting a Condo – But Need More Shade From Your Neighbors? Posted on September 8, 2015 September 2, 2015 Categories Decorating, Window BlindsLeave a comment on Renting a Condo – But Need More Shade From Your Neighbors?